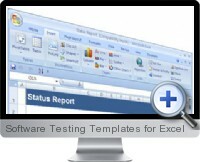 Software Testing Templates for Excel are provided along with Word templates as a complete set of tools for software testing processes, checklists and logs. The standardized software testing solution includes 27 Excel templates and 50 Word templates that save time and ensure efficiency for software development and the testing process. Acceptance Criteria Log - Captures the acceptance criteria when testing each functional area. Action Item Log - Allocates an action item number,description, status (Low/Medium/High), date reported, resource it was assigned to, due date and other additional comments. Change Control Log - Identifies the basis for the change and confirms whether it is disapproved or approved. Includes The Software Change Request Number (SCR) #, Requirements #, date submitted and whether it is approved/not approved, on hold, in progress, or canceled. Change History Log - Describes the date, author and history. Data Access Control - Identifies the individuals or groups who have access to the test cases and their status. Deviation Control Form - Records minor adjustments (i.e. deviations) that must be made to the system in order for testing to proceed. Document Control Form - Identifies, track and monitors test scripts. Failed Scripts - Identifies where test scripts have failed and provide details of the error and its severity. Issue Submission Form - Describes Errors/issues that must be addressed for testing to proceed.Usually sent by users or testers to the Line Manager. Log Status - Identifies Log ID for each log, the nature of the risk/issue, and whether it is Open or Closed. Open Issues - Identifies all open issues by number, date created and tester with descriptions of Target Date,Category, Status, Resolution and Date. Project Costs - Determines the cost of running all test related activities throughout the software development life cycle. Quality Log - Captures the module and test, method of checking, tester, Planned Date, Date Completed,Results, Action Items and Sign-off Date. Risk Log - Identifies the Risk Number, its Date, Type(e.g. Business/Project/Stage) a brief description, Likelihood percentage,Severity, Impact, Action Required, who was assigned to it and its Status. Roles and Responsibilities Descriptions and Matrix - Identifies all the roles on the project, with details of their responsibilities with contact names and email addresses. Status Report - Identifies the function that is under test with specification of business value on a scale of 1-5 with 1 the lowest value and 5 the highest (or whichever numbering system desired) and details of the problem severity broken out by a factor of 1 to 5. Test Preparation - Identifies all activities that must be performed before testing commences, such as reviewing specifications and prioritizing test items. Test Case - Tests a specific part of the system as per the Test Plan. Test Validation Log - Tracks the results of the test cases. Test Script - Provides input for the Area under test, its Set and whether it has Passed or Failed with a Description of the Error And its Severity. Test Script List - Provides input for the Area under test, its Test Case ID, Bug ID, Bug Fixed Date, Bug Fixed By and Fix verified By details. Task Preparation - A checklist to prepare for the Test Plan: Review Software Requirements Specifications,Identify functions/modules for testing, Perform Risk Analysis. Test Case and Validation Log - A Test Case template used to capture the name of the Test Case, its Description,Start Conditions, Pass Criteria, Tester Name, Build Number,identify the Test Data Used, Steps, Action and Expected Result. Test Tracking Report - Tracks the progress of the software tests each Week, capture which are Planned, were Attempted and numbers that are Successful. Testing Budget - Plans quarterly and annual testing budgets. Identifies, quantifies and costs the resources required by the team to complete projects successfully. Unit Testing - Describes the item under test,expected results and whether it passed or failed. Version Control Log - Tracks the Product's Version No., its Date, and Approvals. Web Usability Report - Analyzes the usability of a software project, such as the performance of its Navigation, Graphics, Error Messages, and the quality of its micro content. Software Testing Templates for Word Include purpose built software testing documents, forms, checklists, records, logs, reports, plans, matrix analysis and sign-off documents.